The gastro-adventures of a hungry cyclist and a former chef both with a love of food, If it's in Nottingham, Mansfield, the East Midlands or further afield we've either tried it or are planning to and will review it! Nottingham has a wealth of “all you can eat” restaurants, From curry houses offering a Sunday buffet selection to the likes of May Sum focusing on Asian cuisine all week. Somewhere in the middle of the spectrum is Cosmo World Buffet Nottingham located above Waitrose on Milton Street, a stone's throw from Victoria Centre and amongst an area that is fast becoming Nottingham's Eating District. One of the biggest selling points of Cosmo is it's variety. Serving up a whopping 150 plus dishes is no mean task when you consider there's pretty much everything you and your extended family would be happy to eat. With everything from traditional favourites to more exotic flavours there's a wide range for all. As a blogger that likes to take photographs of food an invite to somewhere with character and structure like Cosmo is a real delight. Hopefully the photo's below do some of the food justice. Love Italian Food- Cosmo Nottingham Has Options for You. Upon arriving at Cosmo Nottingham we were blown away with how extensive the serving space was. Flavours were grouped together into their own pleasantly designed stations and well labelled. If you love your curries you could quite easily make your way towards the House of Spice, fancy something more like Sunday lunch and you could head your way to the Rotunda and Carvery sections although it's worth having a walk round and good look at the food options before loading your first plate. We were really impressed with the Sushi and Tepanyaki selection so headed there first. With beautiful looking Maki Rolls, California Rolls and Nigiri with Prawns and Sake Salmon. In some ways we could have eaten the sushi throughout our visit. We loved the clean, crisp looking Sake Salmon Nigiri and the Prawn Nigiri. Alongside them were plenty of different sauces to try too. The California rolls looked fantastic. We were very impressed by Cosmo Nottingham at this point. For our next plate we moved towards the House of |Spice. We love our Indian food and anything with a little heat so it seemed a logical choice to want for curry next. We love our Mushrooms so the Tikka Mushrooms were an interesting addition to our plates. Nicely juicy with a subtle spice despite looking significantly hotter. The spice was gentle and these would make a lovely accompaniment to a meal. The Onion Bhajo's had a lovely gentle spice to them and a great crunch to their exterior. We'd happily go back for more. The Onion Bhaji had a lovely gentle spice to them and a great crunch to their exterior. We'd happily go back for more. Plenty of attention grabbing bowls to choose from. We opted to try a big selection of the curries from the House of Spice. The joy of somewhere like Cosmo is that if you don't like something your plate will simply be cleared away and you can go back for more when compared to ordering something that's not quite right for you in a restaurant and going hungry as a result. If you're heading to Cosmo and wanted to try something you might never have tasted before we'd recommend the Kathmandu Fish Curry. We know lots of people who are yet to savour the delights and get out their comfort zone as such. The Kathmandu Fish Curry was light and fragrant, creamy and flavoursome with delicate white fish. As well as the fish curry we sampled a nice, easy eating Chicken Tikka with soft, succulent meat, as well as a more earthy Gurkha Lamb curry with a little more heat. All the curries were relatively subtle in their strength. We'd almost call it a family friendly selection in terms of their strength. It would have been nice to see something with a little more kick but we'd happily have any of the curries again. As well as the ready made stuff there are cooking stations at Cosmo where you select your ingredients and the chefs on site will create your masterpiece. You can even choose the pasta your personal dish is made of. I'm not sure I know a child who doesn't like pizza. I even know one that loves Pepperoni Pizza yet hates tomatoes (and hasn't twigged yet!) that I know would devour slice after slice. The pizza's were all thin and crispy with a generous amount of toppings. My Pepperoni slice was very easy work indeed. Pizza at Cosmo with plenty of toppings. From Pizza in Italy we made our way to the other side of the world and onto the Taste of Asia. Asian food takes up a dramatic portion of Cosmo's serving area. From India and the World of Spice to the more Oriental inspired options of the World of Asia. 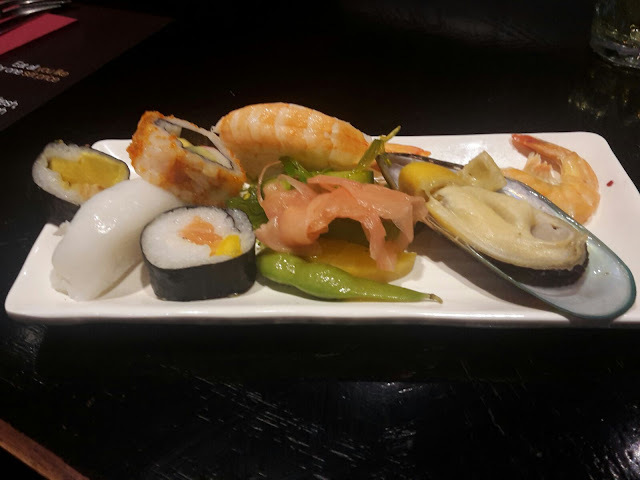 If you include the Tepanyaki and Sushi you see that Asian flavours are a driving force behind many all you can eat style restaurants. The Asian selection at Cosmo is pretty vast and features a lot of the classic dishes you'd expect and maybe a fair few you wouldn't. There's the usual classics like Spring Rolls. Satay Chicken and Prawn Toast to dive into. 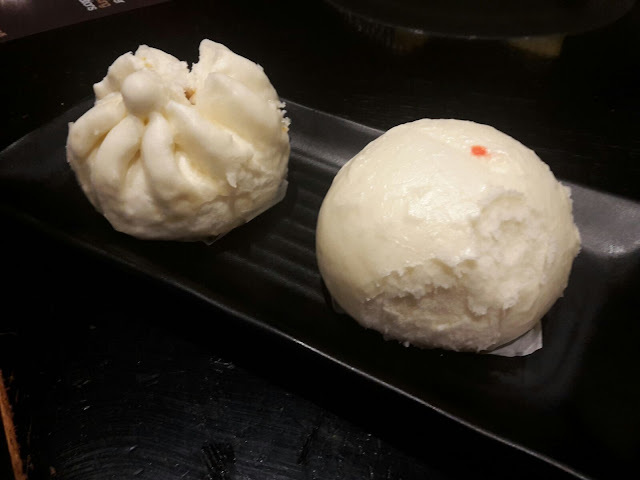 We also timed things right for when the Dumplings came out for the Dim sum selection on our second time up for food. They'd been raided on the first occasion so we'd recommend you grab some whilst you can. The large Steamed Dumplings we felt needed a little longer cooking. You can't have a buffet without Prawn Toast and there was plenty to put on your plate. Nicely toasted and a great accompaniment on your plate. The Spring Rolls were more of a vegetarian option. Filled with lots of chunks of veggies so if you're a bit put off by textures like myself then best to steer clear. The Sesame Chicken was full of flavour with some moist chicken. It worked well with the nutty Satay Sauce. The section we felt a little let down by was the Rotunda grill area. We found the meat to be rather dry. There was a beautiful looking joint of Jerk Turkey which sounded really to our liking. If you're a sporty, bodybuilder type looking for somewhere to seriously stock up on lean protein there were plenty of options at Cosmo but we felt some of the meat had been left out just a little too long. One of the best bits for anyone with a sweet tooth will be the desserts selection. With a veritable smorgasbord of dessert options with something for everyone. Those feeling a little guilty after their size able dinner can opt for a healthy piece of fruit or two from the selection. Whereas the rest of us will head straight for the sweet stuff. With a huge selection of desserts to choose from I was well and truly in my element. With most of the desserts already portioned up it saves making a mess too. There's a fantastic selection of all your favourites in small portions. In some ways there's so much choice that you could choose just to do dessert on a visit. All you can eat dessert is my idea of heaven, although I know plenty of diners for whom it would be hell. Or Some Triple Chocolate Brownie? The Chocolate Brownie seemed to be a firm favourite with the selection being replaced as we walked up to the counter and from the look of those mini pieces of chocolate heaven we could easily see why. The caramel dessert pictured in the middle was a little more like a caramel panna cota. Light and slightly jelly like. Very easy on the palate although lacking real flavour. The Chocolate Brownie was very dense and really probably needed a little more time standing at room temperature before being bought out for eating. It was generously chocolaty hadn't softened up. The Tiramisu was very nice, with delicate coffee flavour and just enough consistency to stay together whilst passing a fork through it. To finish off I headed over to the ice cream selection and opted for an old school Mr Whippy with some classic strawberry sauce to feel like a kid. We really enjoyed Cosmo Nottingham. There was a good selection of food that would appeal to the whole family. It's not really somewhere for the adventurous diner as the selection is very similar to what you'd expect to see elsewhere. The environment for seating is a level above the majority of most of the all you can eat places in Nottingham we've been to. We'd more than happily return however bringing members of the family open to trying new things outside of their usual comfort zone. And I'd certainly come back for the Sushi, as well as the desserts. 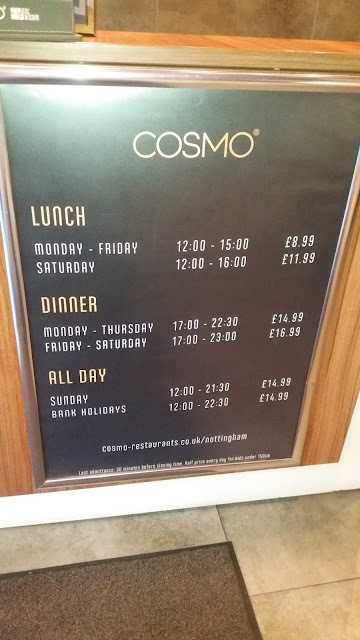 The Cosmo Nottingham Price List as at February 27th 2017. Kids are charged at half adult price as long as they're under 150 cm tall. and for infants under 3 you will pay £3 at Dinner and £2 at lunch which we think represents good value for children's food. Nottingham Food Lovers. Simple theme. Powered by Blogger.